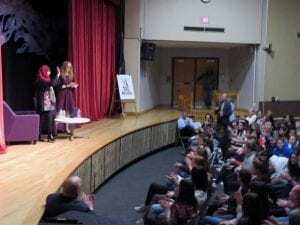 Home > South Orangetown Welcomes Malala! 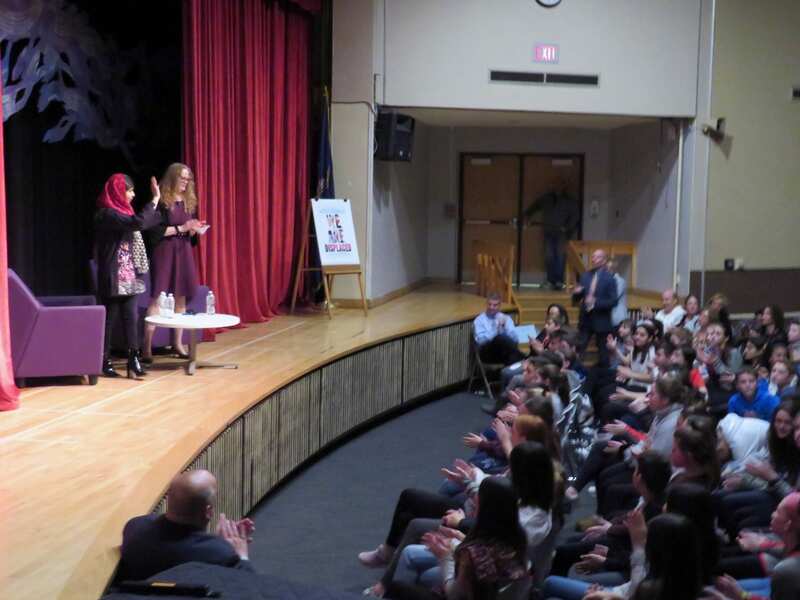 Human rights activist, youngest Nobel Peace Prize winner, and international best-selling author Malala Yousafzai visited with 5th-8th graders and the Tappan Zee High School Social Justice Club in the South Orangetown Middle School auditorium today. Ms. Yousafzai, currently an Oxford University undergraduate, engaged in two question and answer sessions moderated by Cottage Lane Elementary School WERLD Teacher Kristine Wagner and SOMS Library Media Specialist Kimberlee Landgraff. The conversations also included questions submitted by students. TZHS Social Justice Club officers had an opportunity to briefly meet and speak with Ms. Yousafzai upon her arrival at SOMS. At the close of the session attended by seventh- and eighth-graders, SOMS Art Teacher Allison Meyers presented Ms. Yousafzai with a portrait she created with students and Principal Dr. Chad Corey presented her with a student-created piece featuring painted ceramic butterflies inspired by The Butterfly Project. This extraordinary educational experience was made possible through partnership with SOCES PTA, SOMS PTA, Books & Greetings, Little, Brown & Company and The Malala Fund. View more photos on Facebook.